Before the start of the 2018 season, Russell Wilson was included in our top-tier of quarterbacks, a tier which consisted of only three guys. Despite not being in any real MVP conversations and only making the NFC’s Pro Bowl roster as an alternate, Wilson has lived up to his top-tier designation this year. After 15 weeks of play, the Seahawks’ do-it-all quarterback has recorded one of the best single-season big-time throw percentages the league has ever seen. Big-time throws are passes that earn our highest grades. They have excellent ball-location and timing and are usually thrown further down the field and/or into a tighter window; they can also be passes that are thrown perfectly in between two levels of the defense. In other words, big-time throws require the most skill, and this year, Russell Wilson has made such throws at a higher rate than anyone has in the past three years. 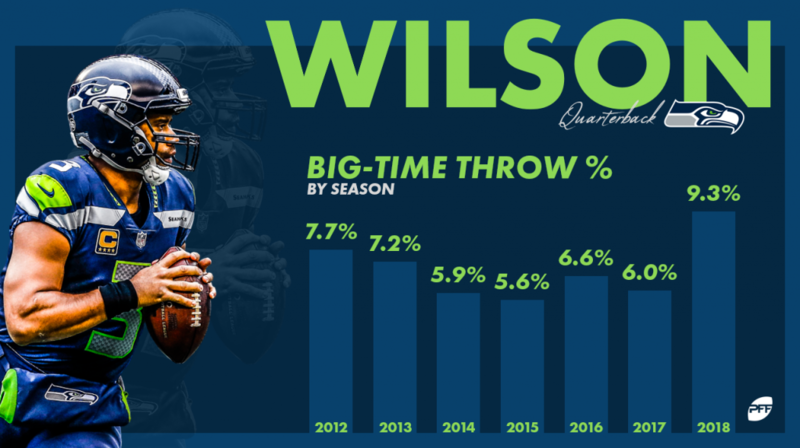 On 377 pass attempts this season, Wilson has made 35 big-time throws, giving him a big-time throw percentage of 9.3%, which is the third-highest mark among qualifying quarterbacks in the PFF era (since 2006). Future Hall-of-Famer Aaron Rodgers ranks sixth this season with a mark of 6.1% and Drew Brees ranks eighth at 5.8%. Patrick Mahomes, who has a great chance to be crowned MVP in a few weeks, ranks third with a mark of 7.6%. Wilson’s display of big-time throw expertise goes hand-in-hand with his excellence in a more traditional stat like passer rating. When given a clean pocket, Wilson has thrown for 2,241 yards, 22 touchdowns and only four interceptions, good for a passer rating of 121.4, ranking third in the NFL. When under pressure, Wilson has thrown for 784 yards, nine touchdowns and two interceptions, good for a passer rating of 89.2 which ranks second. Russell Wilson has been lights out this year. He’s on pace to record his best grade since his rookie year and he’s producing big-time throws at the highest rate in the NFL. One of Wilson’s best weapons throughout his career has been the deep ball, and it’s been no different this year. When throwing deep (20+ yards downfield), Wilson has thrown for 970 yards, 14 touchdowns and just one interception, giving him the NFL’s second-best deep passer rating (126.5), and that’s especially scary because Wilson goes deep on 16.2% of his pass attempts, which is the third-highest rate in the league. Interestingly, Wilson’s throwing excellence comes in a year where the Seahawks have actually gone back to being a ground-and-pound team, as they rank in the top five in rushing attempts for the first time since the 2015 season. In Wilson’s early years, his legs were a big part of Seattle’s dominant running game. Going back to the championship year in 2013, Wilson kept the ball on the zone-read 20.5% of the time. This season, the Seahawks lead the league in zone-read attempts (155), and Wilson has kept the ball just 16 times, (10.3%) – half the rate at which he kept on the zone-read back in 2013. Russell Wilson has progressed and transformed as a player in his seventh season in the NFL. Back then, Wilson-doubters would have advised him to be a game-manager and to pass less and run more. He has gone against that, as he has run much less, passed much more, and turned into much more than a game-manager – so much so that he now owns one of the best big-time throw percentages that we have ever seen. With Wilson among the league leaders in many different passing metrics, Seattle and its dominant offense look ready and poised to make noise come January.